A brazen acting teacher suffering from chronic pain announces he is going to end his life, and spends the next five months hashing the decision out with the young filmmaker who attempts to change his mind. 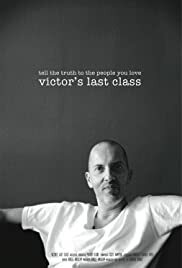 A documentary about Victor D'Altori, a 52-year old acting teacher, who suffers from chronic pain and decides to end his life by committing suicide. This documentary is probably the least depressing I've seen about people choosing to end their life. Victor announces his plans to his friends and loved ones and openly discusses the issue, his rationals, and the effect his act is going to bring on the people he knows. The director, a young acting student, takes part in the film and unavoidably becomes a part in Victor's life, having an effect his his plan. This is a very important film about freedom of choice. The way Victor plans and talks about everything detaches you in a way from the immense feeling your'e supposed to feel and yet makes total sense. Before having his own disease he witnessed what AIDS and Alzheimer's diseases can do to people's body and mind and he is convinced a person has to right to choose whether to live or not and that a person shouldn't suffer just in order to not cause other sadness. Watching the film, you sometimes get the feeling of "his disease is not that bad" and "his suicide can be prevented", hearing Victor talks about these issues, one can understand the rational behind his decision. You have a strange feeling, on one hand feeling a great need to help a man who decides to end his life, and on the other hand understanding that this is his choice and trying to prevent it from him will only make him suffer and not allow him to choose for himself whether to live or not. Victor prepared all the people he knows for his death. And while it probably doesn't make them less sad, it's a nice way of trying to ease the pain. When my mom ended her life it came for me just out of nowhere. Her suicide is both similar and very different from Victor's. But although I wasn't prepared for it and didn't have the chance to tell her goodbye, I never felt angry at her decision not even once and not even for a second.